Inspired by Mark Rothko’s large collection of works, the Abstract Blooms Ketubah captures his signature style — simple, yet stunning. Like many of Rothko’s abstract pieces, this Ketubah contains soft and defined strokes of color, fading from vibrant greens to soft blues. 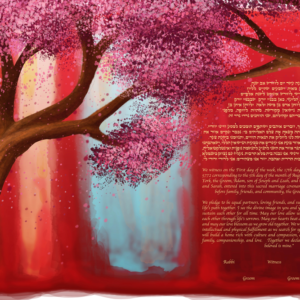 This design contains a beautiful blooming tree with falling pink petals, adding the perfect romantic and lively touch! 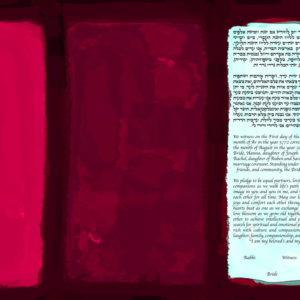 Whether you’re a huge fan of Rothko or simply love the design, this Ketubah will look gorgeous in any room of your home. With a sleek and minimalist composition, this Ketubah is perfect for the couple that loves everything modern and want a Ketubah that will match their personal style. 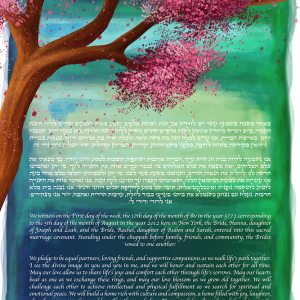 The Abstract Blooms Ketubah will be a moving and important reflection of your relationship and tradition! If there was any artist who truly knew color, it was Mark Rothko. Although many of his collections consisted of seemingly simple designs, a lot of his work had a hidden depth and intention. Everything from choice of color palette to the balance of the overall composition, truly evoked a specific emotion and idea. The Turquoise Wave Ketubah is inspired by this thought — a work of art that is not only stunning, but uniquely embodies the heart and importance of the Ketubah tradition. With bold strokes of turquoise and purple, the 1 contains a beautiful contrast of dark and cooler tones to beautifully bring out the Ketubah text. This Ketubah is perfect for the couple that loves modern art and wants a Ketubah that reflects their love and style. Whether it’s the day of your wedding or 20 years from now, this Ketubah will be a stunning reminder of your love and commitment to one another. Paul Gauguin's popularity and artistic recognition didn't come until well after his death, however his work still remains a gorgeous influence in the world of art. Known for his use of color and ability to capture human emotion and movement, the Hora Ketubah is inspired by his unique and dynamic style. 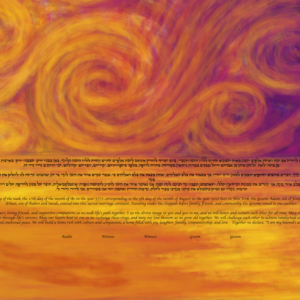 This Ketubah contains tons of gorgeous bold colors and movement. 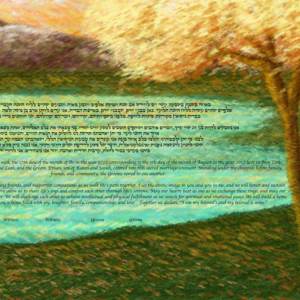 The beautiful texture and shading work to seamlessly tie together the Ketubah text and artistic design. 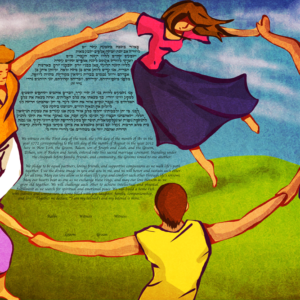 Friends dancing hand in hand, the Hora Ketubah is a reflection of the beauty of love and all it's forms. Wether it's the love you share as a newly wed couple (or a couple of 30 plus years! ), or perhaps the love you share for close friends and relatives. Although your Ketubah is a special symbol for the two of you, it is also be special to the friends and family that will share these important milestones in your lives. The Hora Ketubah is not just a reflection of your relationship with each other and your loved ones, but also a FUN celebration of love! Mark Rothko's transformation into his unique abstract style came with basic color and a more organic, simple design. His collection was a “breath of life” during a time that art was too straightforward and embellished. These matured pieces became his signature mark and were met with awe and respect. The Mauvelous No. 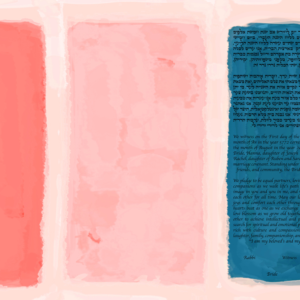 18 Ketubah is inspired by Rothko's daring move to break out artistically and the collection that was created as a result. This Ketubah is a breath of fresh air with simple, clean color. A beautiful addition to a couples' new home together, this Ketubah will fill you with life and love every time you see it. By the mid 1950s, Mark Rothko began to utilize more darker tones and shades in his paintings. Although his collection was met with developing fame and success, Rothko desired that his paintings were adored and purchased for something more than just an artistic fad. Rothko stated that color is “merely an instrument”, that the contrast of similar shades and the way they work with structure are meant to inspire something more than just a beautiful design. It's not only Rothko's signature style that constitutes as a beautiful inspiration for a Ketubah design, but also his emotional process and method behind his art. The Wisteria No. 18 Ketubah exhibits bold purple shades and evokes depth and meaning — the perfect centerpiece for your home and life together. In 1936 Mark Rothko began writing a piece comparing the similarities between the work of modern painters and the art created by children. Rothko felt that “child art transforms itself into primitivism”. It was these writings that expressed Rothko's shift into abstract art and the beautiful works of art he would later create. A collection of abstract pieces that are the essence of artistic thought and modern art. Although his book was never finished, Rothko drew the conclusion that the ability to artistically draw is already advanced, that in reality, “we start with color”. The Jazzberry Jam No. 18 is inspired by Rothko's pieces — bringing beautiful design and Ketubot art back to basics. Although completely simple and minimal, this gorgeous Ketubah is the perfect blend of a unique tradition and bold contemporary design. The artwork created by Mark Rothko in the late 1940's didn't lack in defined shape or size. This was something that deviated from the norm at that time, and redefined larger art pieces as something more personal, rather than arrogant or “pompous and grandiose”. Rothko stated “The reason I painted them, however… is precisely because I want to be very intimate and human”. The Raw Chestnut No. 18 exhibits a warm, brown color palette with a simple shape. Inspired by Rothko's though provoking designs and the warmth and comfort of home, this bold Ketubah adds an intimate and modern touch to any room. The beach always been the perfect place to celebrate family, romance, and the beauty of creation. The Starry Sea Ketubah is inspired by the canonical work of Vincent Van Gogh, but combines the bold shades of sunset at the shore to create a dramatic scene full of emotion and quiet contemplation rich with color. The Starry Sea Ketubah doesn't just depict the Beach, but the beauty of love. Look closely at the shoreline, and you'll see the shadows of a couple walking together, reflected in the gold shimmer of the sun's light. Perfect for lovers of the Beach, Van Gogh aficionados, and the ones they love. The Autumn Trees Ketubah captures the beauty and magic seen only during a beautiful day in Autumn. Inspried by Seurat, this Ketubah features a gorgeous quiet landscape with softer colors, accented by fall reds and yellows. The contrast between these beautiful shades work together to create and emphasize paint strokes. The gorgeous landscape of this Ketubah is perfect for the couple that has a love for the outdoors and experiencing nature's beauty together, hand in hand. Wether it's breathing in the cool crisp air on a fall drive through the mountains, or sharing a hot pumpkin spice latté on your front porch, these moments are always better shared — especially with the love of your life. 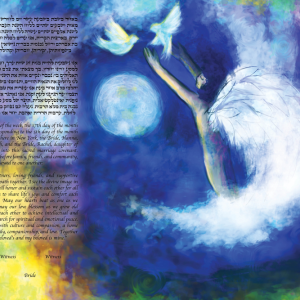 Framing the text in a dramatic night sky, this Ketubah captures the essence and drama of love and marriage while invoking the mysteries of the heavens with a female figure reaching skyward. It is perfect for the couple who wishes to sign a Ketubah which speaks to their identity as lovers, Jews, and enthusiasts of the Chagall modernist aesthetic. Inspired by the beautiful simplicity of Rothko's works, this Ketubah is the perfect blend of modern art and creation. The vibrant trees blooming with life and color are brought out beautifully by the striking and distinctive backdrop. The reds and pinks met with the cooler tone of blue and white creates a gorgeous framing while also emphasizing the text area in an elegant way. 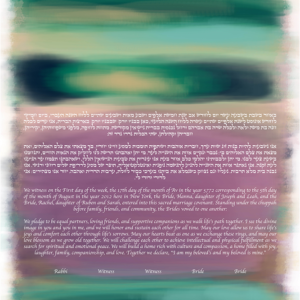 This Ketubah is for the couple that aren't afraid of a little color in their life! Rothko Blooms is perfect for that couple that loves modern art done in a completely unique and fresh way. The tranquility of the trees combined with the pop and blend of vibrant tones paints the sentiment of a long life together — full of color and love. 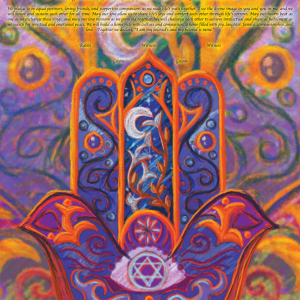 Few things are as universally recognized in Jewish symbolism as the Hamsa, or the artistic representation of the Hand of G-d. Offering good luck and defense against the 'evil eye', the Hamsa has been a feature of Judaica full of spiritual significance, and stunning beauty. Offering an updated take on Russian artist Marc Chagall’s classical Jewish imagination, the vibrant colors in this Hamsa weave together Jewish symbolism with meaningful forms and a spirit that calls on the joy and passion of love. We can't help but feel a connection with it!